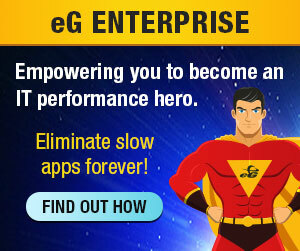 A few weeks back we made the eG Enterprise Manager available as a Virtual Appliance. If you are already using VMware vSphere/ESX, you can simply import the virtual appliance on one of your servers and within a matter of minutes have the eG manager up and running. You wont need to find a system, install the OS, install the Java Development Kit (JDK), and a database server, and then start the eG Enterprise installation. The virtual appliance is an all-in-one package that runs Cent OS, has the JDK, an Oracle Express database, and the eG manager and agent pre-installed. You just have to import the virtual appliance to a vSphere server, start the virtual machine, apply the eG license key, and you are ready to start monitoring your infrastructure (both virtual and physical). Its really as simple as that! Find out more about the eG Enterprise Virtual Appliance here.